Columbia Falls, MT (October 2017) PROOF Research, the industry leader in the production of aerospace-grade carbon fiber rifle barrels, cut-rifled stainless steel rifle barrels, and lightweight hunting and military rifle systems, has chosen H&G Marketing to represent them throughout the United States. H&G Marketing, headquartered in Big Lake, MN, is a national sales and marketing organization with over thirty-five years of experience. With over thirty-five regional representatives and managers with countless years of combined experience, H&G Marketing provides sporting goods manufacturersthroughout the United States with expertise on the industry and proven marketing techniques, including in-store promotions, product training and trade show exposure. 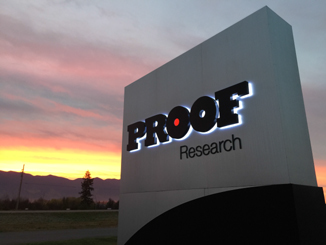 PROOF Research is a science-driven manufacturer of lightweight precision rifle systems and record-breaking steel barrels and carbon fiber-wrapped barrels. The company’s Advanced Composites Division develops next-generation materials to produce innovative weapon systems that lighten warfighter load while increasing durability and effectiveness. For more information about H&G Marketing, contact Scott Dobry at sdobry@hgreps.com or visit their website: www.hgreps.com. For more information about PROOF Research, visit www.proofresearch.com. PROOF Research is a science-driven defense/aerospace company committed to producing the highest performance carbon fiber rifle barrels, match-grade steel rifle barrels, premium hunting rifles, and weapon systems utilizing next-generation composite materials to lighten warfighter load while increasing durability and effectiveness. PROOF Research’s goal is to make reduced weight, unsurpassed durability, and match-grade accuracy a reality for all of its customers. Headquartered in Columbia Falls, Montana, PROOF Research maintains research and manufacturing centers in Montana and Dayton, Ohio. www.proofresearch.com.